It was Cake Club time again the other weekend. I joined the Clandestine Cake Club in Dundee last year and I am now officially one it’s co-organisers along with Jac from Tinned Tomatoes and Becca from Becca Bakes! I have to say the buttercream was amazing! I could have eaten a whole bowl of the stuff on it’s own. The cake inside was lovely too – a light ginger cake, which did not contain the usual treacle. It did have a lovely gingery kick from grated ginger and ground, and this went really really well with the sweetness of the banana frosting. 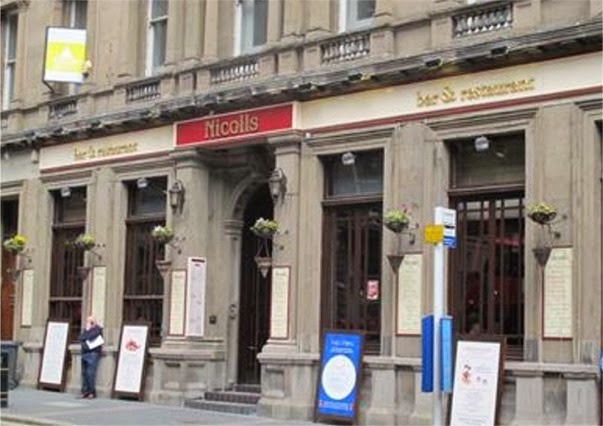 The meeting was held in Nicolls in Dundee’s Commercial Street. The bar has recently moved to new premises and is a great venue for a night out and for bar meals too. My colleagues at work swear by their macaroni and cheese. The staff were very helpful and managed to try some of the doubly decadent cakes which were brought along. These included Jac's piñata cake, filled with Aero bubbles, which spilled out when the cake was cut into! (Above) There was a millionaire’s shortbread cake, which was very decadent. An Hombre cake, which I had never tried before but was very delicious. Also present was a peanut butter and chocolate cake (I never got a chance to try this one sadly), white chocolate, raspberry and cream cake (which was triply decadent! ), a Guinness and chocolate cake and many more. Grease, line and flour four 8” cake tins and set aside. Preheat the oven to 180C. In a saucepan melt the butter, sugar, syrup and milk and bring to the boil. Remove from the heat and let cool slightly. In a large bowl, sift the flour, ginger, allspice and bicarb. Add the liquid mix to the dry and stir, just until the dry ingredients are incorporated. Add the grated ginger and stir through. Divide the batter equally between the cake tins and bake in the oven for 20 to 25 minutes or until a toothpick comes out clean from the centre of each cake. Allow to cool slightly before removing from the tins and cooling completely on a wire rack. To make the buttercream, in the bowl of a mixer, blend together the butter and icing sugar until pale and creamy (about 5 minutes). Add the banana extract and mix that through. Lastly add the mashed up banana and mix this through for a couple of minutes. (Half this recipe to frost cupcakes). 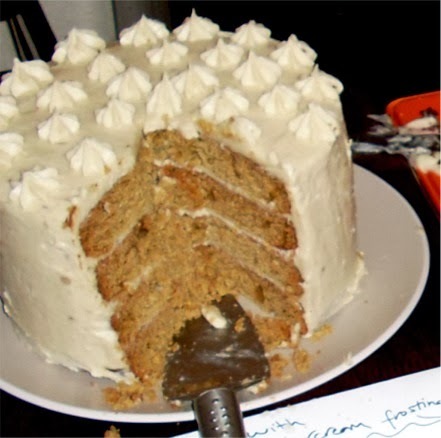 To form the cake, spread a few tablespoons of frosting on each layer, and then lightly frost the outside of the cake. Place this in the fridge to chill for half and hour to an hour. After this time, frost the cake with the rest of the frosting and pipe on decorations if you so wish. The cake is best kept refrigerated before serving! Enjoy (especially the buttercream!). And thank you again to Nicolls for providing the venue for our evening. And GBBO week 7 - thought of the week - and it has nothing to do with the baking. This week's highlight was Sue and her very smutty comments!! I shan't repeat them here, but very very funny! Ye, very talented bakers our Dundee lot Emma! All I can say is oh my goodness. I want a piece of this right now! The banana buttercream was to die for Laura - even if I do say so myself! Wow I would've had a field day at this cake club, everything looks and sound so decadent and gorgeous. Bet there were sugar comas all round! Haha, I certainly needed a good sleep after it Kat! Love the combination of ginger and banana - not seen it before. Yum. Nice height too...I do like a tall cake as it increases your chance of a big slice! Impossible to get a wee slice with that one CC!! Love the idea of ginger and banana!